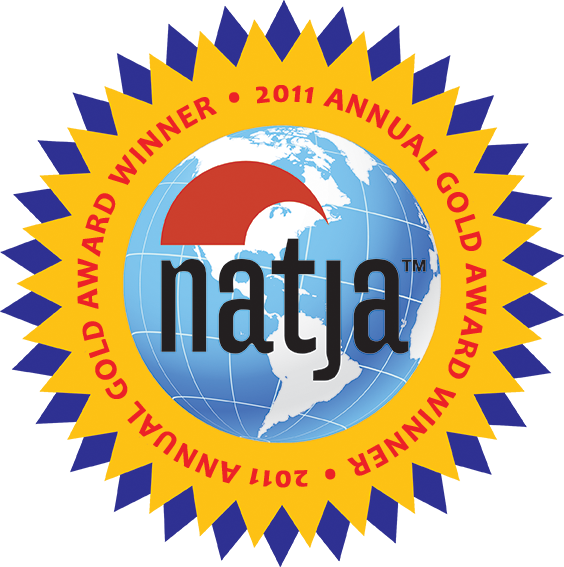 On our recent road trip from New York to Florida, we barely escaped a blizzard, and sought refuge in the “Sunshine” State. We arrived at the end of the coldest December in Tampa Bay’s history. 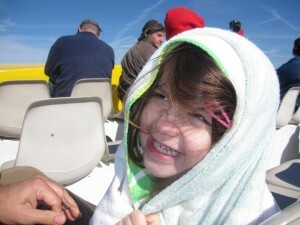 Then, because we weren’t cold enough, we set out on the water. For a ride on a speedboat. 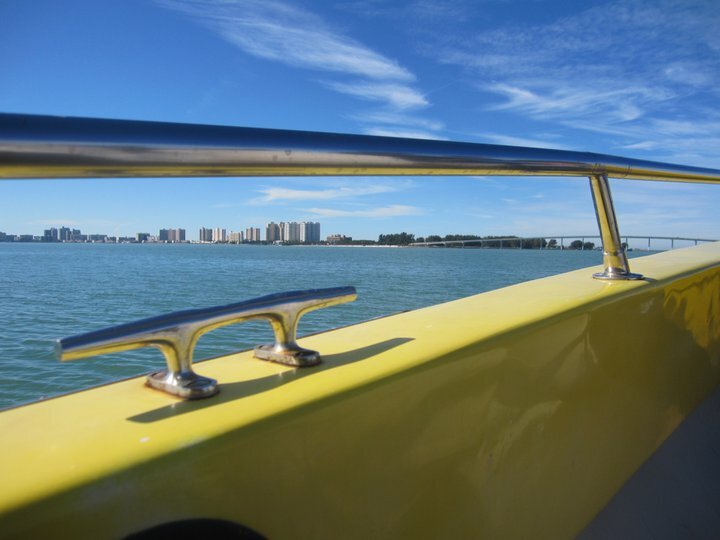 We headed to the municipal marina in Clearwater, which sits on the calm, blue-green waters of the Gulf of Mexico. While there are several dolphin tour boats and fishing expedition guide boats, many of whom hawk their services on the dock, we had a distinct experience in sight: the Sea Screamer, the world’s largest speed boat. Even though the temperature was in the 60’s range, the four of us were up for the challenge, since the sun was up in a clear sky. We figured, as New Yorkers, we could handle any chill with stalwart fortitude (we were wrong; more on that later). My mom and dad, our hosts for the week, were much smarter, of course. They waved us off at the pier with knowing smiles, and went for a stroll during our 75-minute cruise. The Girl prepares to catch air as the engine revs up. I was naturally drawn to the “world’s largest” part, and at 72-feet long, the Sea Screamer is a big boat. 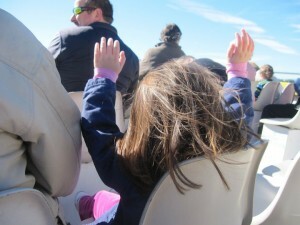 In order to get the kids on board (literally and figuratively), I stressed the “speed” part. She reached speeds of 35 miles an hour, which is fast for a boat. In a humorous juxtaposition, docked next to the big Sea Screamer is the “Little Toot” boat ride. And on the other side, the Captain Memo’s pirate ship. My kids gave that one a longing glance, and I promised to take them next time. The ride at full speed is exhilarating, even though it is intermittent between frequent “no wake” zones. Captain Barry’s narration and well-rehearsed jokes (“the more you drink, the more dolphins you’ll see”) were amusing, and the sea-themed music was fun (“just sit right back and you’ll hear a tale, a tale of a fateful trip…”). We passed the homes of the rich and famous, including Hulk Hogan’s estate and the former Fort Harrison hotel where Keith Richards wrote “(I Can’t Get No) Satisfaction” in 1965. 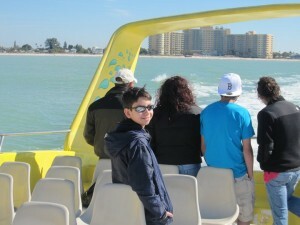 Another feature of the Sea Screamer excursion is the guarantee of dolphin sightings. And by “guarantee,” they don’ t actually promise you’ll see an Atlantic Bottlenose dolphin while you’re out. If you don’t, they guarantee that you can come back within thirty days for another free trip. Alas, we only once caught a quick glance of a fin, after which I sent poor Matt on a fool’s errand to stand there for 20 minutes shooting video of the water’s unbroken surface. It was nice to know that we could have returned for another trip, but not only did we not have the opportunity on this visit, we were also frightened to be once again subjected to the cold. I wrapped The Girl within an inch of her life in the beach towel we brought as an afterthought. I smugly thought I would do the smart thing and bring it to dry off sea spray. It soon became the only barrier between her and (imagined) frostbite. See, the thing about going fast on a boat is...it makes the air rushing at your body feel much colder than when you’re still. This hardy New Yorker, wearing her trench coat and mittens, was nearly crying from the discomfort. I spent most of the trip in a warmth huddle with any willing family member. The Boy is regrettably entering his “I’m cool, and I need to distance myself from my parents” phase. 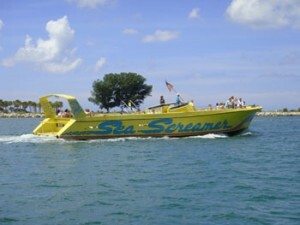 The Sea Screamer was custom-built almost 19 years ago. She’s an 82-ton vessel, measuring 72-feet in length, and 19-feet wide. She has twin-turbocharged, 900 horsepower diesel engines. The Sea Screamer is Coast Guard licensed. There are two bathrooms aboard, and they sell drinks and snacks. 6. I can’t fault the fine people operating the Sea Screamer for the weather, but I willingly admit it had a negative impact on the experience. The sight of some cute, frolicking dolphins might have warmed my heart enough to stop my teeth from chattering, but no such luck. So, if the weather is warm, please go. If the temps are below 70°F, wisely follow my parents’ lead, and stay on dry land! Almost looks like a hot day under the Florida sun, doesn't it? HA!